The days are getting shorter, but the afternoons sure seem to be getting longer. Those hours after the wee tot wakes up from nap are sometimes super challenging, with crying, wailing, foot stomping, and plain boredom (and I’m not just talking the babe). Time to get out the paints! Young kids might not seem like they can do much more than scribble, but that’s what they are supposed to do. During a child’s first creative marks, she is figuring out how to hold a crayon or paint brush and learning what she can do with it. That doesn’t mean she’s too young to try new things, learn more about art – or look at famous art! Repetition is key, and doing the same thing over and over sure helps hone skills (such as holding a mark making implement) but can get boring for parent and child. So, why not mix things up with the help of a famous artist – Mondrian! Piet Mondrian was an interesting artist who painted in a way no one had done before. At first he painted in a realistic manner, but later began exploring cubism, a movement in art where things were a bit more abstract and angled. This is when he discovered the wonders of squares and painted some of his most famous artworks such as Composition with Yellow, Blue, and Red. This is a simple painting focusing on geometric shapes and the primary colors, which is great inspiration for an artwork your wee tot can totally master! Help your child get started by using some black plumbing or electrical tape. You probably have some hiding in your junk drawer or the garage or basement. Cut lengths of the tape and create a geometric design on a sheet of 9 by 12-inch white construction or drawing paper for your child to enjoy painting. 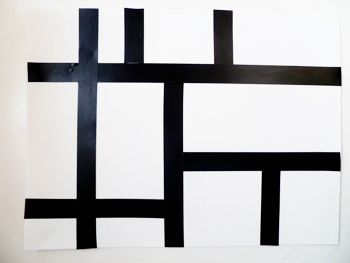 Older kids can cut and position the strips of tape on their own, creating a Mondrian inspired design. 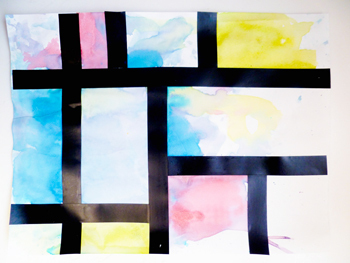 Share with your child examples of Mondrian’s artwork. Encourage her color recognition skills by pointing to each color and seeing if she can tell you what it is. For the really wee tots, this is a wonderful opportunity to build language development! And, don’t forget discussing the shapes she sees in the painting. This introduces shapes and math concepts to your child. Older kids can see if they can count all the shapes in the painting! Now your child can use red, yellow, and blue tempera or watercolor paint to fill in the squares. Don’t worry if she’s not into staying in the lines – younger kids don’t always get that concept. Older kids can concentrate on staying in the lines and not having the same color square positioned next to each other – just like Mondrian! Once your child’s Mondrian inspired creation is dry, it can be placed in a frame and displayed somewhere in your home showing your child how much her artwork means to you! We did a Mondrian activity during the late Summer early Autumn. I love the electrical tape idea. You are bound to have it around at home.